98k JPEG Autumn October 1985. 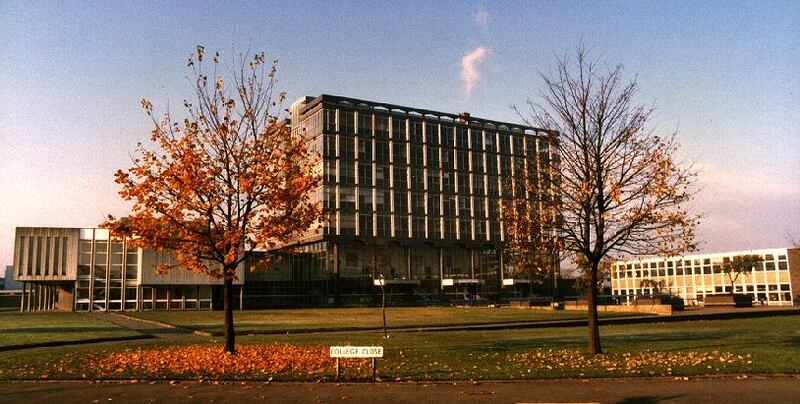 This is one of the buildings forming Bolton Institute, called Deane Campus. Deane Tower was designed in the 1960's and completed in 1970, constructed of concrete, steel and glass, designed by Geoffrey H. Brooks. The Institute have their own web pages. The tower block is scheduled for partial demolition during 2003. These pages started life at Bolton Institute, you may take a look in the computer room which includes some history of the computers as well. The webcam has now been moved to view the rear of the tower so you can view the progress of the demolition. 95k JPEG. In the grounds of Bolton Institute, with Deane Campus in the background. February 1996. 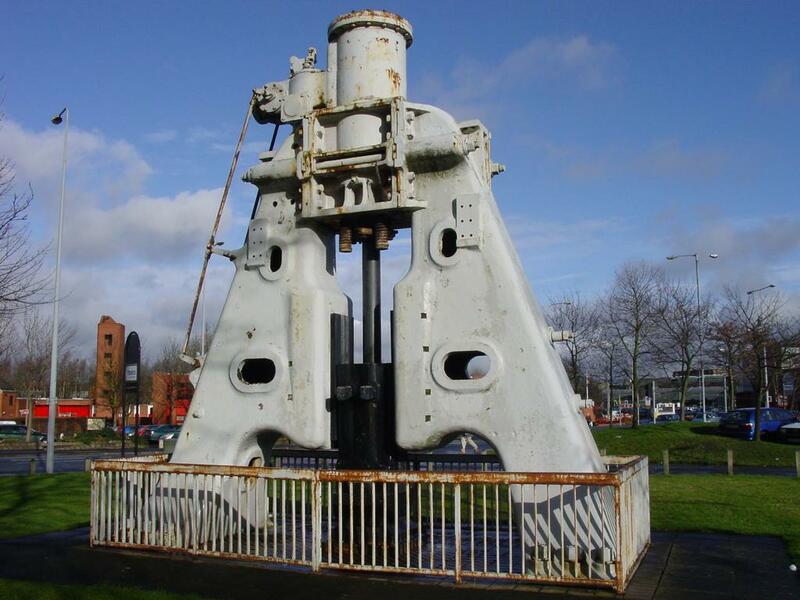 This steam hammer was used in the Atlas Forge in Bolton, when the foundry closed, it was donated to the (then) Institute of Technology. Nasmyth & Wilson steam hammer 1917. 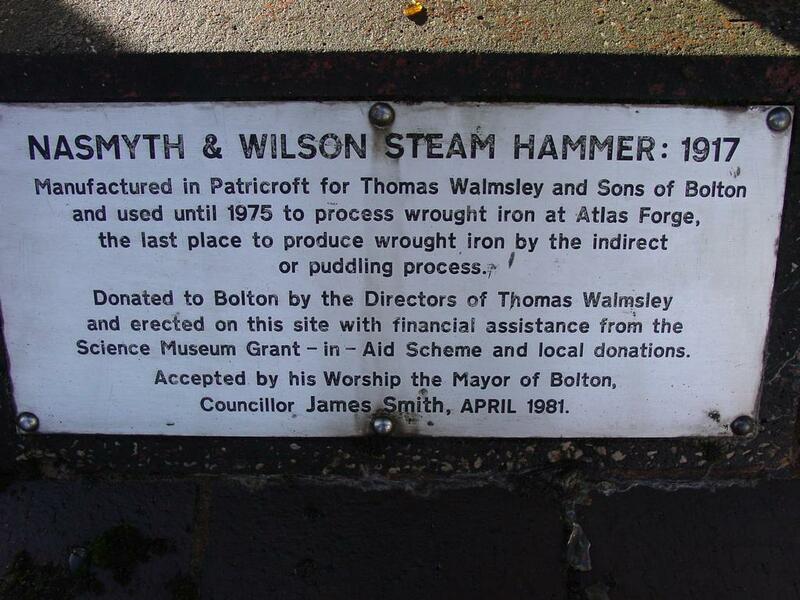 Manufactured in Patricroft for Thomas Walmsley and Sons of Bolton and used until 1975 to process wrought iron at Atlas Forge, the last place to produce wrought iron by the indirect or pudding process. 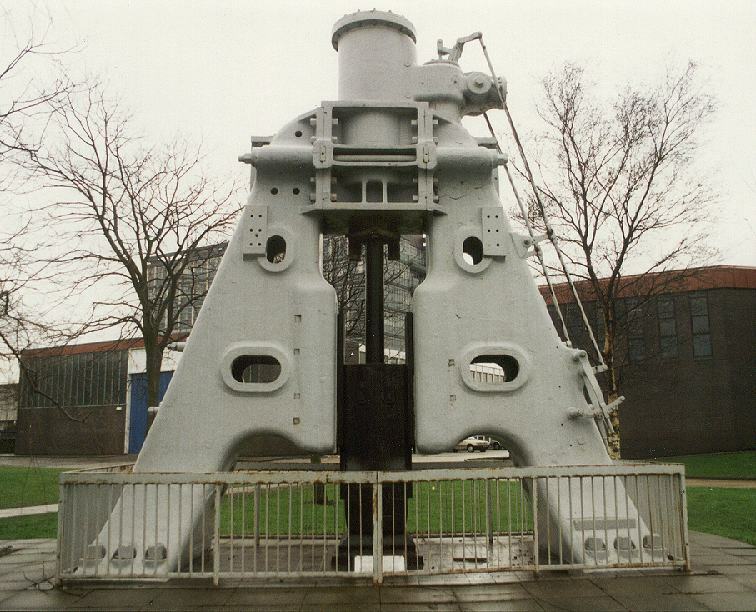 Donated to Bolton by the Directors of Thomas Walmsley and erected on this site with financial assistance from the Science Museum Grant - in - Aid scheme and local donations. Accepted by his Worship the Mayor of Bolton, Councillor James Smith, April 1981. 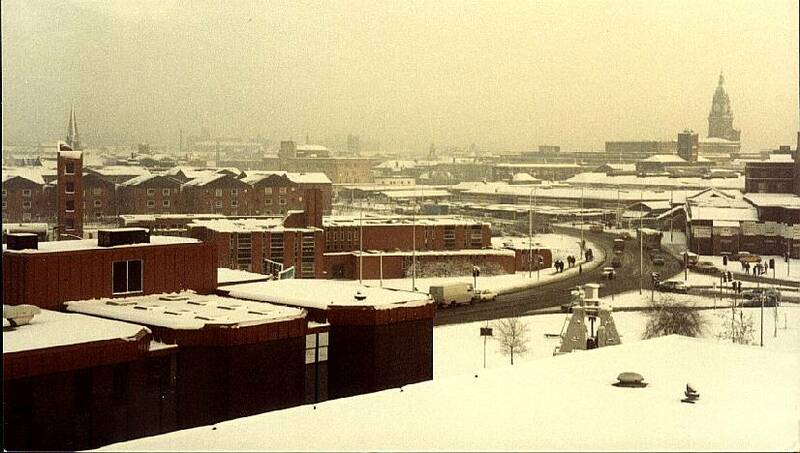 72k JPEG from Bolton Institute down Moor Lane, February 1984. The fire station with the training tower is on your left, the top of the steam hammer in the foreground and the town hall clock on the right. It's not very often snow falls as heavily as this. What is paeticularly interesting about this picture, from the enlarged JPEG, you can make out the low canopies of the outdoor market in front of the market hall (right of centre) and to the centre right is the (believed) Flash Street Mills which were a retail complex before demolition for the supermarket which now occupies that location. 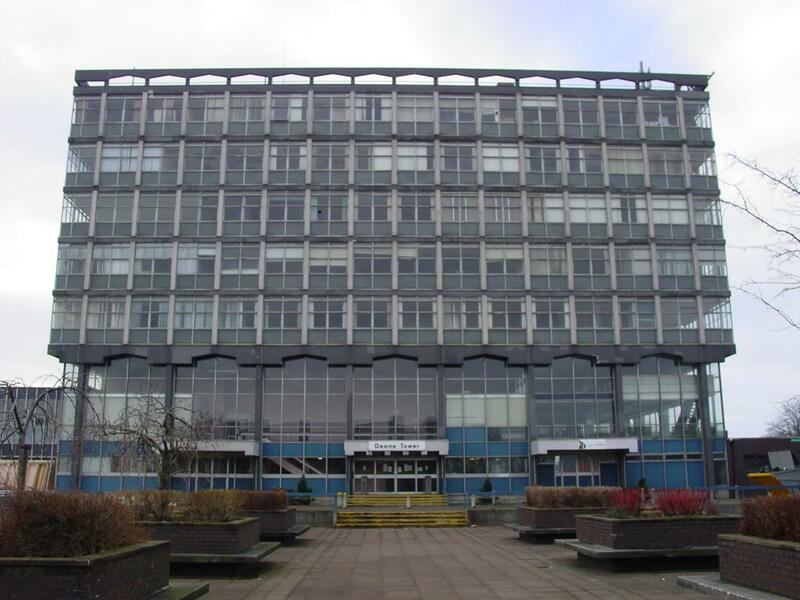 This is Chadwick Street Campus, part of Bolton Institute. This centre is geared towards teacher training and vocational training. 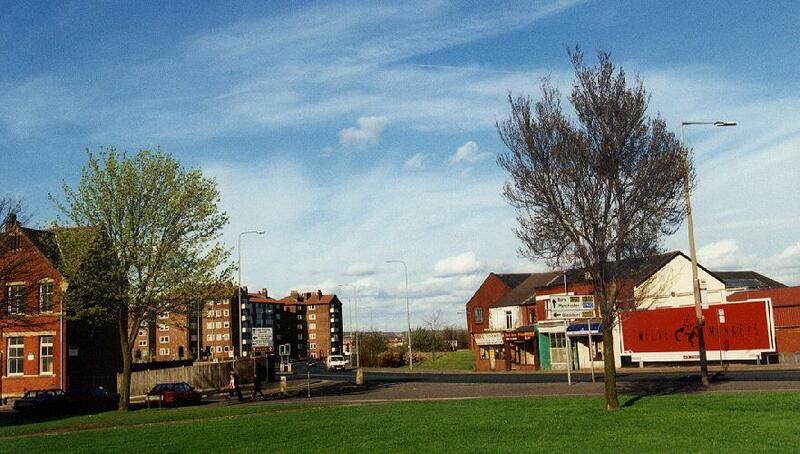 You can also go onto Deane Road.